Why doesn’t every city have a huge Hollywood-style sign up on a hillside, welcoming you to town? As soon as I saw that Saint John has one, I knew I was going to like this place. And even better: you can actually drive up to, and walk around, Saint John’s giant letters — and visit an historic fort in the process. It’s not hard to find your way to the Saint John sign, just by guessing. After all, it’s the most visible landmark in town. But here’s a little bit of help. 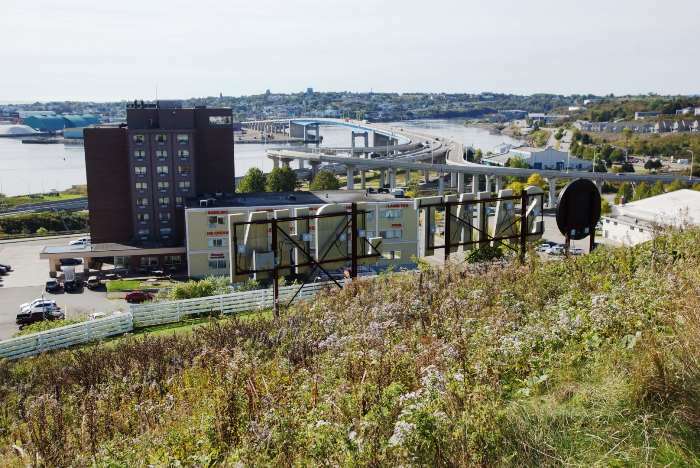 From downtown Saint John, find your way to Somerset Street, which crosses over Highway 1. Once you’re on the other side, make a left-turn onto Magazine Street, which runs on the opposite side of the hill. From there, the side roads that lead up and over to the Saint John sign and Fort Howe will be fairly obvious. If I had any doubt about what city I had just driven into on the start of Day Two, this sign cleared things up. 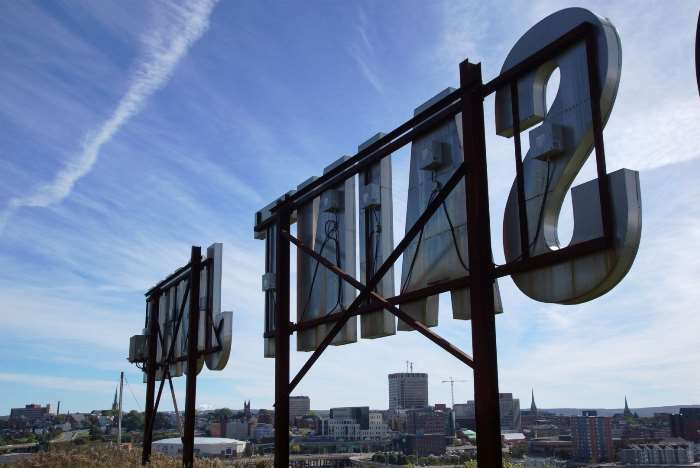 Saint John identifies itself with some massive lighted letters on a hillside just north of downtown. I didn’t hesitate to get out of the car and walk around for a close-up look at this landmark. The City of Saint John installed this sign in 1999, to celebrate the new millennium. It was originally illuminated with fluorescent tubes, which ran up a power bill of about $9,000 dollars a year. In 2014, the city retrofit the sign with LED lighting, which dropped the annual electricity cost to around $1,000, and made the sign much easier to maintain. The big sign may have been what drew me here, but it’s not the only attraction on this hill. 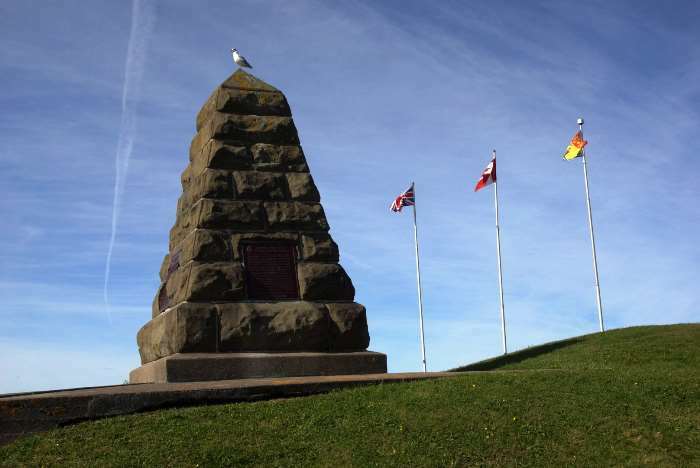 Near the sign, you’ll find the Fort Howe National Historic Site. It was the first historic site to be included in Canada’s National Parks system, but it was later dropped from the system and turned into a city park. One reason was, it was an unimpressive site — nothing more than a nice viewpoint over the city with some historical footnotes. The blockhouse you see today was built in 1967. While the blockhouse makes this spot feel more historic, you can’t do much more than just look at it from the outside. 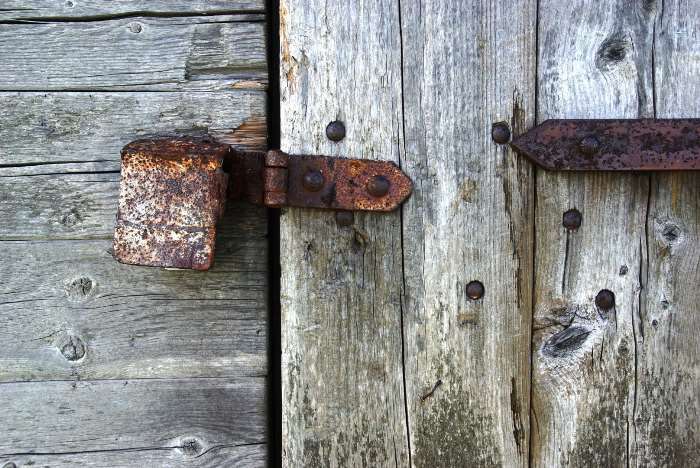 It’s locked and off-limits. 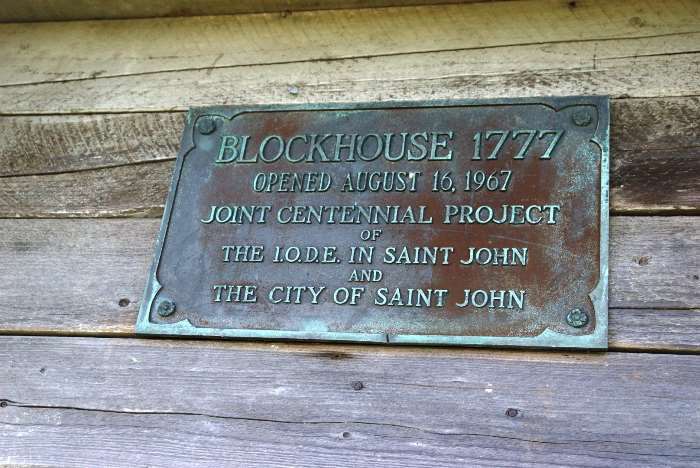 A small plaque explains that the 1967 blockhouse is a replica of the 1777 structure. 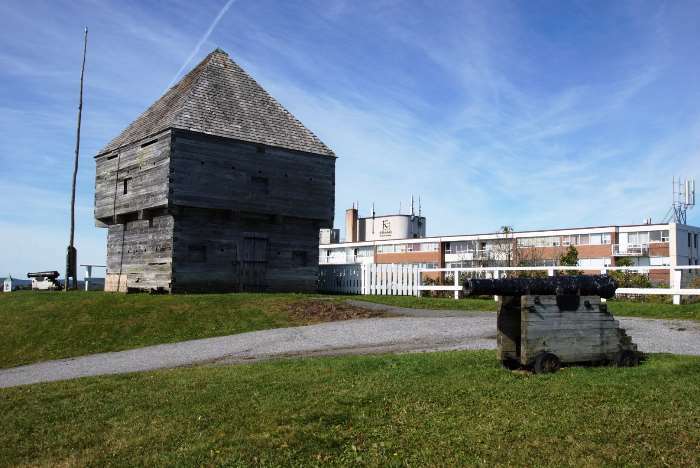 Fort Howe originally had two blockhouses, along with a barracks for some troops, and eight cannons guarding the city. Now, just one old cannon overlooks the skyline. Down the ridge a bit, there’s a pyramid-shaped monument to the Indian Treaty of 1778, which helped keep the peace between European settlers and the First Nations tribes in the area. The monument is located directly above the Saint John sign. From here you have a nice view looking west, towards the Saint John River and the city’s industrial west end. 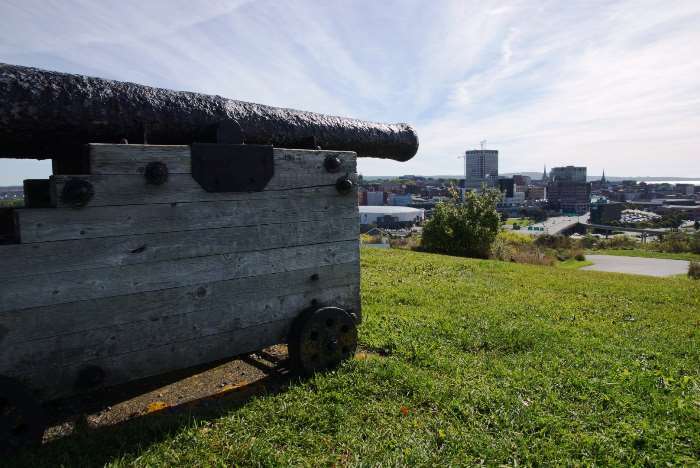 Fort Howe’s historical value may be minimal, but it provides a great place to view the city. The best reason to drive up here is to check out the giant letters, up close.